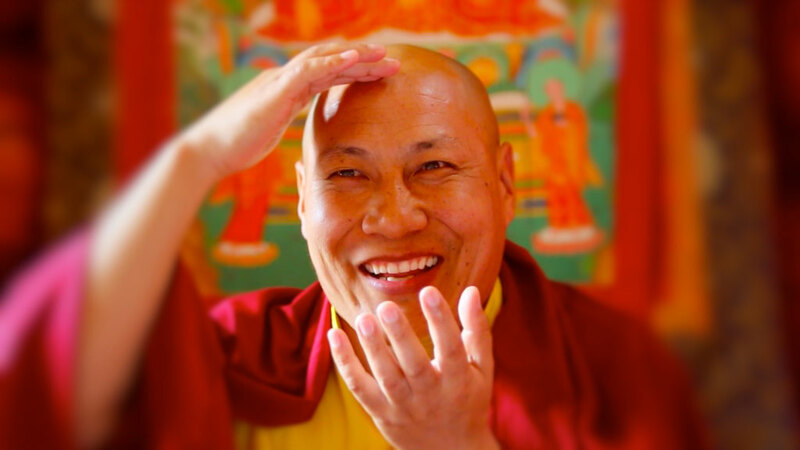 In 2012, we began recording videos of Khenpo Sherab Sangpo’s meditation teachings. They are published on our YouTube channel. Please consider supporting our meditation community with a donation if they benefit you. Thank you. To start, beginners should cultivate renunciation and bodhicitta, and then take refuge from a spiritual teacher. One may then move on to practicing the common and unique preliminaries. This involves a five-fold accumulation of 100,000 repetitions that must be practiced in a genuine manner and linked with the three supreme methods of the preparatory step of cultivating bodhicitta, carrying out the main body of the practice without holding a conceptual reference point, and concluding by dedicating the merit. Following this, at the second level, one should accumulate the requisite numbers of mantra recitations and practice the approach of the three roots (guru, yidam, and ḍākinī), focusing on that one in whom one has faith. These practices should be carried out as spelled out in their respective sādhana texts. Once these have been practiced well, one would move on to the third level that involves inquiring into whether it is body, speech, or mind that is the most fundamental, and then examining and investigating which of these three creates saṃsāra and nirvāṇa. At this level one should also investigate and come to a definitive conclusion concerning the origin, presence, and departure of the mind. Then, by analyzing its incidental deluded perceptions, one will understand once and for all that the mind does not arise, abide, or cease. Fourth, one differentiates motion and stillness in terms of tranquility and insight (śamatha and vipaśyanā). In other words, one is introduced to tranquility (both with and without focal point) and the insight into the fundamental nature of motion and stillness. Fifth, the Great Perfection instruction manual Yeshé Lama (Wisdom Guru) is taught in its entirety, with introductions to the separation of saṃsāra and nirvāṇa and the empowerment into the display of awareness. The sixth level includes the system of recitation and meditation concerning the approach of the six fields, the key instructions on self-liberating the six collections. Seventh, the key instructions of the luminous Great Perfection, the victorious summit of the nine vehicles, are imparted. This involves extensive introductions to the practices of breakthrough (trekchö), direct leap (tögal), and other such practices. In breaking through to primordial purity, one is introduced directly and experientially to self-present wisdom. In leaping directly into spontaneous presence, one is introduced to the appearances of the three kāyas that manifest on the path. These extremely secret, unsurpassed key instructions of the luminous Great Perfection encompass all the vital points of the path that are to be practiced by individual practitioners. This is the system of key instructions that has been passed down by masters such as Adzom Drukpa Rinpoche according to the fundamental principles laid out in the four mother and son Heart Essences. This description of the stages of practice was written according to the tradition of the lineage masters for the students of Bodhicitta Sangha.